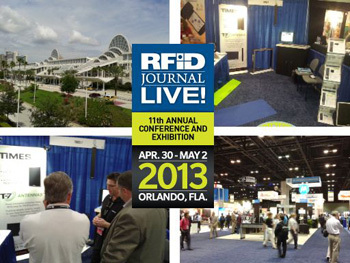 Times-7 | Record levels of interest at RFID Journal LIVE! With a 15 percent increase in attendees over last year’s show, the largest global conference and exhibition in the RFID world showed a marked growth in the industry, with high levels of activity in a very busy tradeshow exhibition hall. Times-7 was literally 'overwhelmed' with an almost non-stop flow of visitors to our booth, recording some several hundred people over the two main tradeshow days. As well as the increased numbers at this year's show, the record response was also due to the RFID community having more specific requirements, that in turn led to specific interest in Times-7, being a specialist RFID antenna company. Significant interest was seen across both UHF Near-Field and Far-Field Antenna product ranges, with immediate sales resulting from the show for our A5530 Ground Mat Antenna, A1001 Proximity / Near Field Antenna, A6034 Multi-Purpose Antenna, and the A8060 Door Frame Antenna.